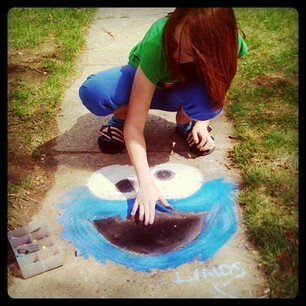 My 13 year old is refreshingly far from too old for spring-day-sidewalk-chalk marathons. 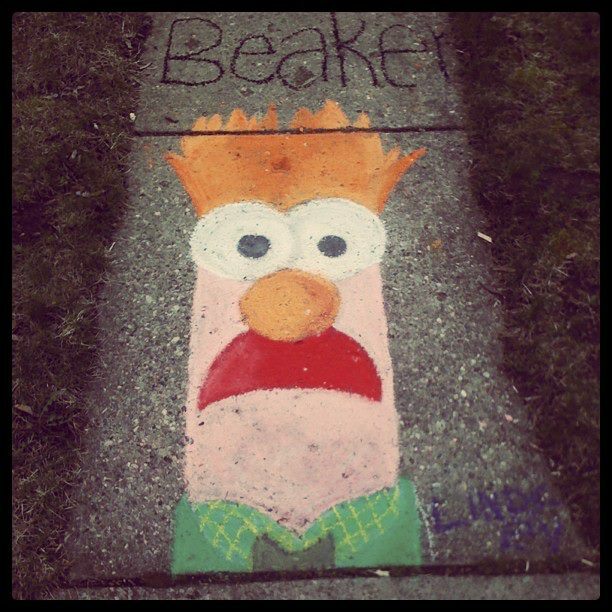 The spring weather always brings out the chalk at our house and my sidewalks go from boring dirty grey to colorful masterpieces. Unlike some parents who find it annoying to have walkways covered in graffiti art – I find it just as lovely as the flowers that bloom near by. This year, however, they were not just colors and stick figures. They were smiling faces of very specific friends. Lindsey grabbed her pastels (the expensive stuff) and ditched the cheap chalk and began blending and birthing life into some old childhood friends she loved. Muppets! I know she does great art – but It sorta surprised me. Here are a few snapshots of my front walk… so far. She plans to progress on up the walk with new smiling faces each square. We have had collections of neighborhood kids and parents all standing and watching her, bikers stop, and rubber neck drivers. The smiling faces she creates are leaping from the walkway and putting smiles on faces of all who pass. It’s fun to watch. 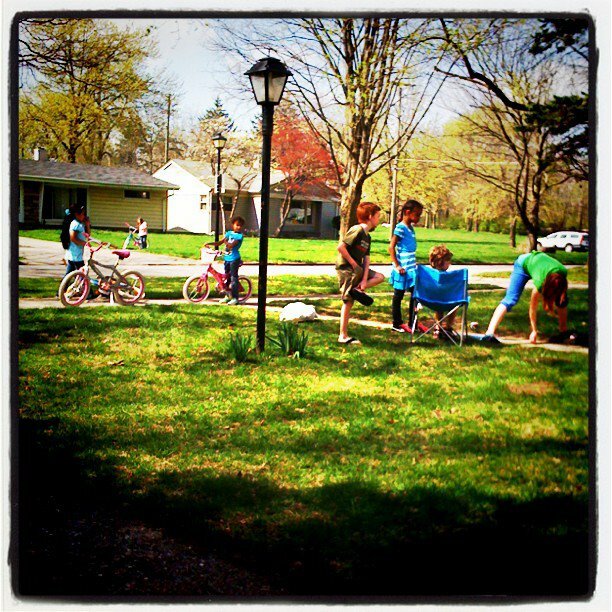 The yard was full of kids all day. They’d ride their bike around the block over and over and over so they could catch a glance of her work… shy to just stop to gawk. Then mom came next time and it was time for a chat with mom 🙂 I had to brag a bit right? That’s what Mom’s do. So today, her dad and I went out while she was at school and looked for chalk. We found some one place, and then another. 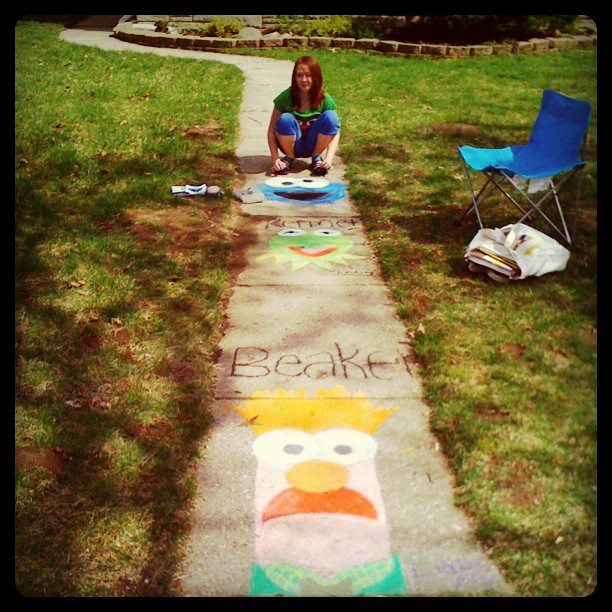 We ended up with a slew of new chalk of different sorts… all not even touching the cost of her precious pastels – but we’ll leave getting those till the real deal… The Chalk Walk entry at the Three River’s Festival in July… She’s going to enter this year! More than likely – it will be Muppet faces smiling up from her square. So Lindsey – I know you read these blogs – Know how proud your Dad and I are of you. And I just had to show you off a bit! Love ya sweetie!! Can I have the keys ? !